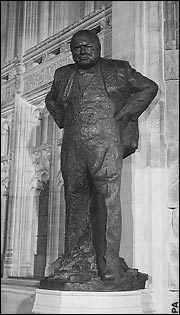 For those readers who have visited my workplace, the Palace of Westminster, you may have seen the imposing statue of wartime PM and "Greatest Briton" Winston Churchill in the House of Commons Members' Lobby. The large bronze statue is extremely prominent, as one has to walk past it to get into the Commons Chamber. Now look a little more closely - you will see that the outer layer on Churchill's left foot has rubbed away, leaving it shiny and gold-coloured. This, as regular readers will know from our visit to the Palace, is because of the tradition adopted by MPs of rubbing the great man's foot for luck as they enter the Chamber for a debate. Visitors to the Palace have caught on, and now Churchill gets his foot stroked on a daily basis. For Liberals and Left-Wingers, there are also statues of Lloyd George and Clement Attlee, whose feet are also being visibly rubbed. "There is a great debate about what we should do. Should we stop people from touching it altogether and restore it or allow them to continue paying their respects in this way? There is a problem but I suspect that it's going to be very difficult to stop people from doing it altogether." So, if you come and visit the Palace (and we strongly recommend that you do! ), spare a thought for poor old Churchill's foot. If however, you DO want to destroy a statue in the Members' Lobby, it looks like the planned statue of Baroness Thatcher will be ready before this year's summer recess, so get ready to start rubbing (or try and find innovative ways of smuggling sledgehammers past security).